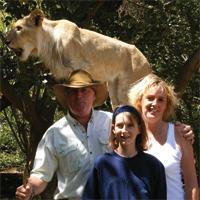 Meet Julie and Graeme Bristow and chance upon a close encounter with the wild. From hand raising cheetah and lion cubs to setting up the innovative concept of ‘Walk with the Pride’ at several locations, this privileged couple shares with us their exciting story, a life reserved for a chosen few. Julie Bristow was born in Marlborough Wiltshire, in the United Kingdom. As a child she was already passionate about animals, secretly ambitioning to become a vet. A regular visitor to the Longleat Safari Park in Warminster, she clearly recalls at a young age, stating “I’m going to work here one day” and amazingly enough in 1986, she actually did go to work there in the “Giraffery”, with giraffes, camels, zebras, kangaroos and lamas! And this is exactly where she met Graeme Bristow who had just brought four baby elephants from Zimbabwe to the Longleat Safari Park. As fate would have it, Graeme whisked her off her feet and they took off for Zimbabwe. There she settled very well to life in the bush with all the African wildlife around them as Graeme owned a Game Reserve called Pamuzinda in Selous. This is where Julie got introduced to the big cats – the lions and the cheetah. The couple had the extraordinary opportunity to live with a lovely lion called ‘Caesar’ in their house! Raised from a cub, he stayed with them until he was two years old, at which point with Julie’s advanced pregnancy he was returned to the park. It was Caesar that changed how Julie felt about big cats and it was from him that she found the confidence to work alongside them. Graeme is remarkable with lions and has infinite patience with them when working, especially in the film making world. He is the third generation in his family to be handling and training the lions, with expertise and techniques passed down from his grandfather. Another defining moment in their lives was when they made a film together with the BBC Wildlife Unit directed by John Downer called “Lions Spy in the Den”. This was an incredible experience and Julie remembers working all day with lions of all ages and the famous boulder camera, hard work but infinitely rewarding. Graeme’s most distinct memory of animals in his childhood is the one of the night his father came into his room and placed two new born lion cubs at his feet and asked him to keep them warm! Before coming to Mauritius the couple was based in Zimbabwe but often took lions and cheetah to other countries for film work such as the Kenya Masai Mara, South Africa, Botswana & Namibia. Graeme also took 137 head of game to Bangkok to start a new safari park; he traveled for 35 days on a ship from Durban, and whilst on that trip he had two lion cubs born that he hand raised as he felt they were in danger from the other lions also traveling with the mother. Seeing an opportunity in Graeme’s expertise with big cats, Julie suggested that they should start a ‘walk with the lions activity’ and this is how ‘walk with the pride’ was first conceived in Zimbabwe in 1995 at the Pamuzinda Safari Lodge. The couple went on to initiate another ‘walk with the lions’ project in Victoria Falls, Zimbabwe in conjunction with Shearwater, to date a very popular activity there. From Zimbabwe, they set sail for Mauritius where they joined up with some returning Mauritians Jano and Odile Labat, ex sugar cane farmers and wildlife enthusiasts in Zimbabwe and the four of them started the company Safari Adventures. Julie believes that working with big cats in Mauritius is no different to working in Africa but is thrilled to see that the experience is thoroughly enjoyed by the locals and visitors alike. An average day begins with the cleaning and feeding routines of the lions and cheetah, bottle feeding can be very time consuming and has to be monitored carefully. There is also time set aside for training which is all done on a reward basis, then the couple take the cheetah and the lions for a walk on a lead around the park and finally there is play time, the cheetah cubs love playing football! The Bristow’s ambition is to develop this venture along with Casela into a natural safari park for the enjoyment and education of the locals and visitors. Their aim is to educate people about wildlife and how to conserve it and why it is so important for future generations. The motto of Safari Adventures is to be “in touch with the wild”. Julie and Graeme are a couple who go a step beyond that. They can vouch to change the way you look at the big cats again.